Aarakshan is a hindi movie about the so-called reservation practices culturing backward castes in their upliftment. The subject of the movie is highly controversial and often debated, discussed. People have always been on opposite sides of the table. Some supports reservation thing and while some strongly resents against it.You may be the people of General Category or you may be the one from the so-called reserved category – whatever category you are in – Here is a movie about it – the hot and burning topic of Aarakshan in educational instituions and government jobs. Well the movie represents various arguments in support and in against the reservation thing. It is a socio-political drama. 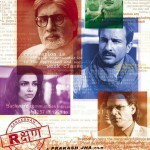 Directed by Prakash Jha, the lead role is played by Amitabh Bachchan, Saif Ali khan, Deepika Padukone and Manoj Bajpai. All lyrics of aarakshan songs are written by Prasoon Joshi while the Music is composed by Shankar-Ehsaan Loy. The songs are sung by various singers including Mohit Chauhan, Shreya Ghoshal, Shankar Mahadevan, etc. Most of the shooting of Aarakshan film is done in Bhopal, Madhya Pradesh. Well, this movie is really about a very hot topic and people would like to know how the movie goes. Whatever category you belong to, this movie is a must-watch.